Some of you are already familiar with my methods of building modules. The most recent being the Prefabs “Friendly Arm Inn” and the older ones being BG, Beregost and Candelkeep. You can see and download them on the Vault. I thought about bringing to NwN2 the old D&D module named “The Sunless Citadel”, however for the Forgotten Realms. 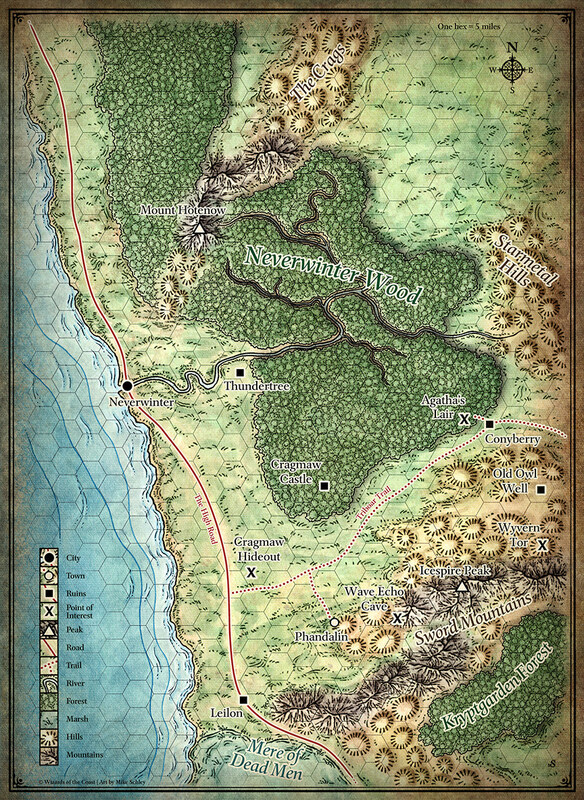 In the book called “Tales From The Yawning Portal”, it is suggested that the Sunless Citadel is located in the foothills northwest of Thundertree a village East of NeverWinter (see map). The hamlet of OakHurst would be located in the same area. However, I am a little perplexed and I wonder if I should rather situate this adventure in Beregost or near the Friendly Arm Inn. I started doing OakHurst anyway, while having this question in mind about the perfect location for the start of this adventure. 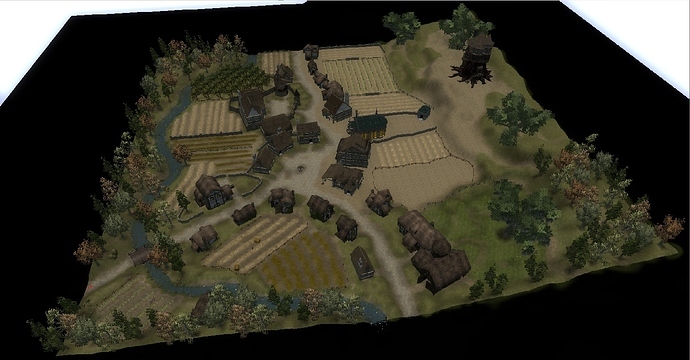 Although this is not part of the adventure itself, the selected village (or elected) is there only to provide the characters with information about the citadel and as a place of replenishment. If the tavern/inn is a minor thing, personally I’d just grab a prefab inn from the vault to use. 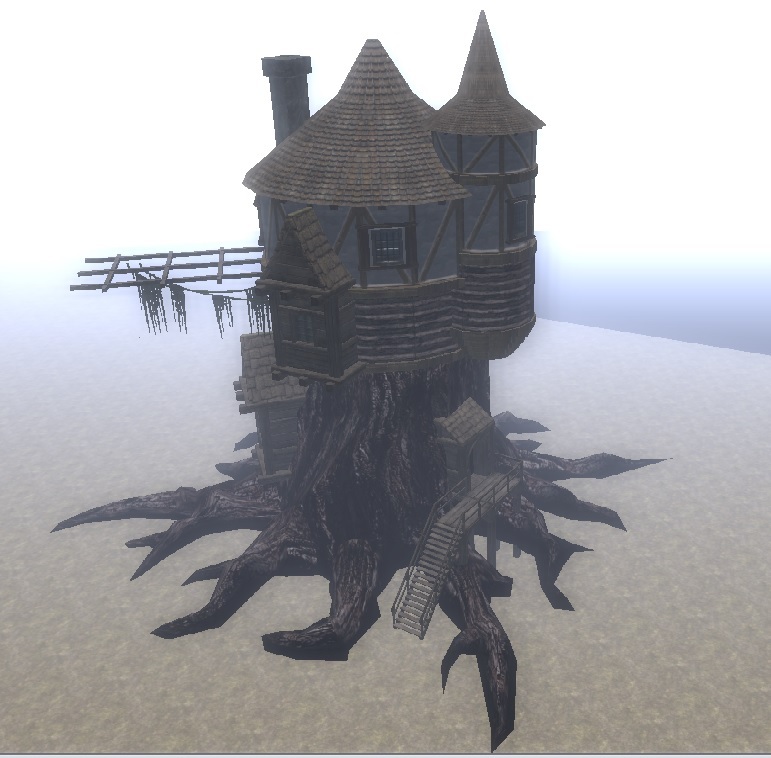 That’s why I was wondering if I should not just start from one of my own Prefabs. Or I finish OakHust that I started this week. I haven’t finished OakHurst yet (35% done only) and I don’t even know if I am going to use this little village, but here is a temporary preview, and some Druid Tower I made maybe for it. This was one of my favorite NWN modules. I am so happy you are remaking this! I will definitely play this when it’s done. It looks amazing so far! That druid tower is neat, i never would have thought of that. I always liked the idea of “periurban druid”; that is to say a druid who gets on well with an agricultural village (Druid of Chauntea, for example). I imagine the tower located at the edge of the village in a piece of land not yet exploited and surrounded by small trees. The kind of Druid who also makes things (scroll, potion, wand, etc.). OakHurst area progress (70% finished). My schedule does not allow me to focus full time on this project, but I do my best. I have not finished texturing the East part as you can see. That’s OakHurst so far, at least “my” version of this hamlet. It does not correspond at all to the official plan, sorry for the purists. 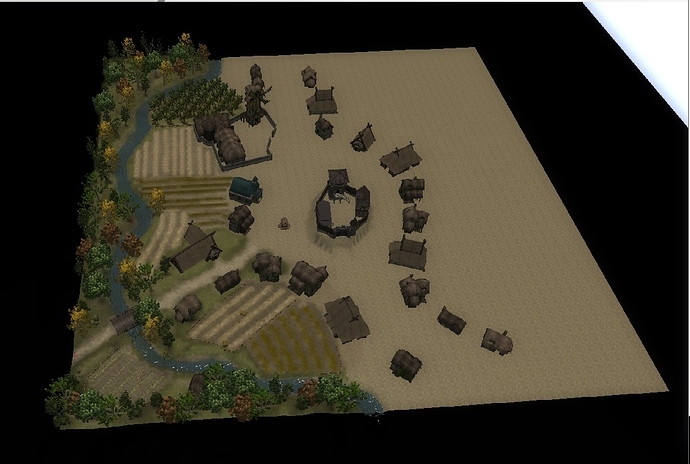 I designed the village this way to make it a little more “dynamic” for other builders who would like to use it for the development of another module. 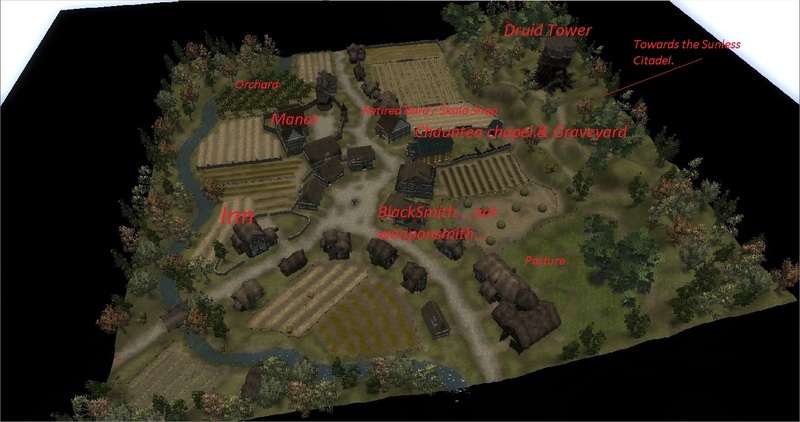 This agricultural hamlet is located in the Forgotten Realms, has a chapel dedicated to Chauntea (obviously …), a little blacksmith, a small inn, a Druid’s Tower and I added a Manor run by a Castellan who administers this little piece of land. Very nice looking. Don’t worry about ‘purists’. Going from another source into actually building something in the toolset is always an act of translation. Get the spirit right. 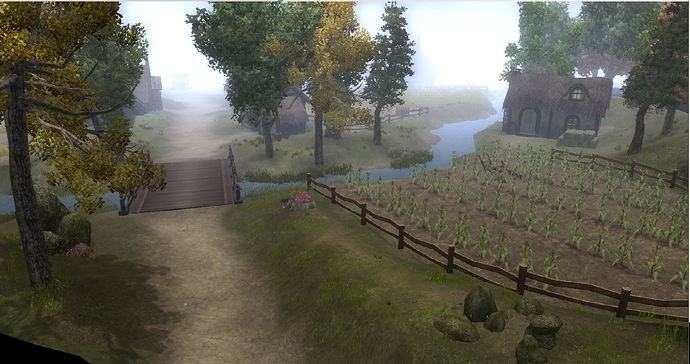 No defenses or even just plain ‘fences’ places this hamlet in civilized or at least well patrolled region. Or “afraid of the druid”. I love the area so far. And I echo kamal on the druid’s home. I am looking forward to seeing how this turns out. Or, like the Spartans . . . they didn’t need fences or walls. I must say that this is looking great so far! Do you think you may do any of the sequels to this one? The Forge of Fury, The Speaker in Dreams, The Standing Stone, Heart of Nightfang Spire, Deep Horizon, Lord of the Iron Fortress, and Bastion of Broken Souls all seem like decent modules. I had the The Forge of Fury in mind, yes.